As I noted last week, it appears we’re spending time with several other members of Class 1-A to see how they’re faring during the exam. While technically “filler” to some, this is more like expanding upon content that wasn’t shown in the manga, and I for one enjoyed it. First things first. 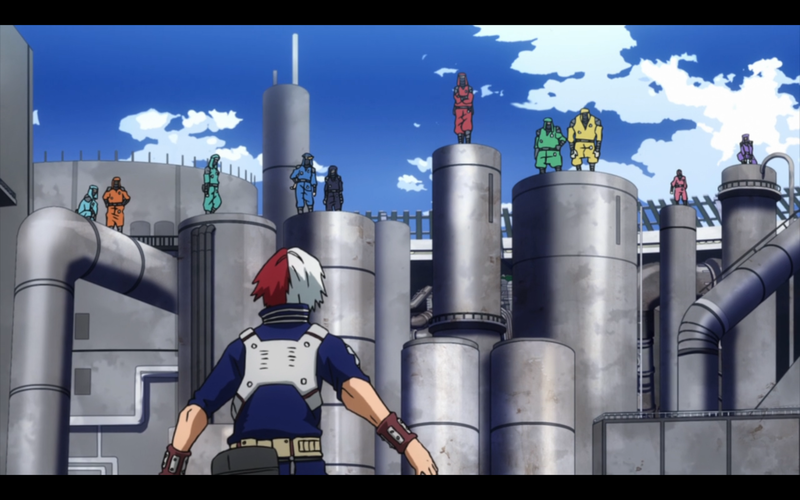 Todoroki fights a bunch of ninjas. He fights them and comes out on top by using his surroundings and catching them off guard. After that, we get a glimpse at some brewing tension with him and the Wind Boy Inasa. Wind Boy gives IcyHot a mighty dirty look, and proceeds to pay him no mind. Hmmm. Curious. This moment of strategic genius brought to you by Darjeeling Tea: when you really need to double your IQ to destroy your enemies, accept no substitutes. 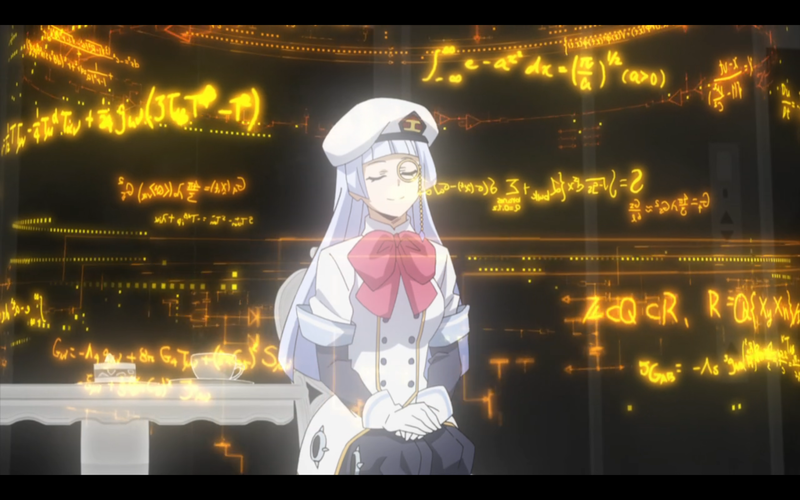 As for her plan, effectively it’s a strategy of rendering her four opponents’ quirks unusable, or immobilizing them entirely. 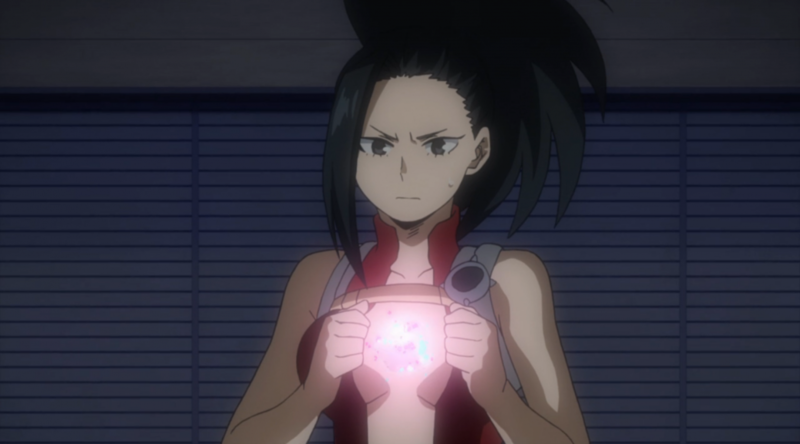 Jiro and Froppy are specifically targeted, while Sai plans for Momo to overexert her quirk while trying to salvage the situation. It’s pretty interesting to watch this play out: it gets tense for our group, and Momo has to adapt fast and come up with a plan that will get them out of this messy situation, while also ensuring they pass the exam. 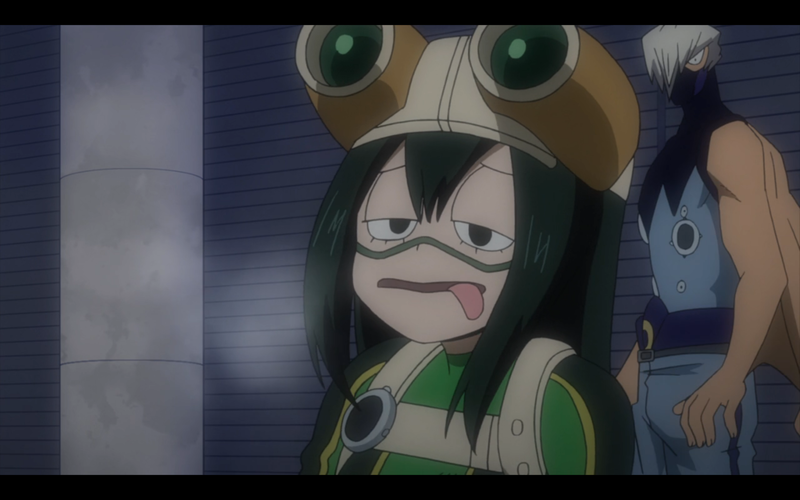 Don’t freeze Froppy, that’s mean. It’s a big scene especially for Momo, who last season feared her own intuition facing off against Aizawa, and to see her come into her element both as a leader and a strategist (under a ton of pressure, no less) is great. She’s inspired by Deku’s iron will, of course. To see that level of personal inspiration shown among many of the students, but in a big way for Momo in particular, was fantastic. And when she does succeed in finally getting the best of the team from Girls Hero Academy, it’s a great, satisfying moment. She incapacitates all the opponents camping outside the door with a giant soundwave, opting to attack rather than defend. Seeing her fend off Sai once again with a clever trick, at the last minute, is just icing on the cake; all in all, great character development for her this week. We then see Bakugo, Kirishima, and Kaminari cross roads with a guy from Shiketsu, who has a gross ability to turn people into meatballs. [Editor’s Note: WHAT. Just WHAT.] 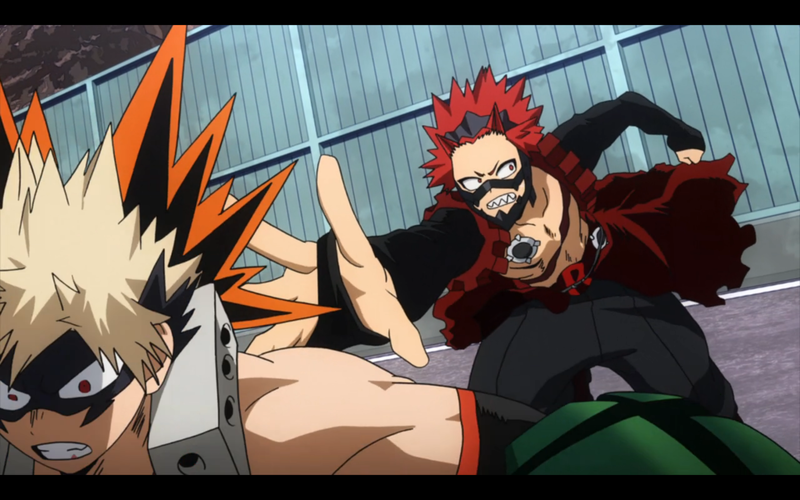 Kirishima sacrifices himself for Bakugo’s sake, showing how much he cares. All the while Deku, Ochaco and Sero are busy formulating a counterattack to try and pass this exam. 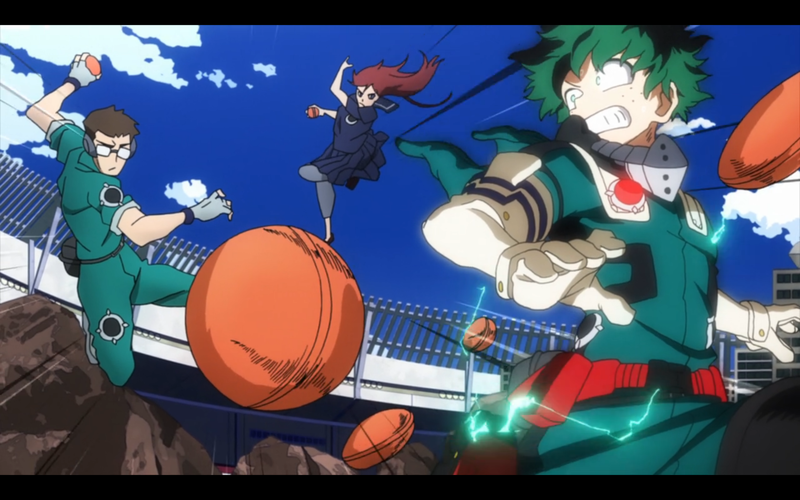 I really love how– even setting the romantic element aside– Deku and Ochaco now demonstrate so much trust and respect in each other’s abilities. Meanwhile, we see Aizawa explain to Joke that he’s not even worried for his students, because he sees that every time Bakugo or Deku are involved, the entire class works to match their level, bringing out the best in all of them. He’s not scared, he’s excited to see it all play out, and that’s a nice beat that works really well on top of all the other character development we see this episode. Next week: More fighting! More unconditional trust between Deku and Ochaco! More of that gross Meatball guy! Well, not so much looking forward to Meatball guy, but you get the idea.